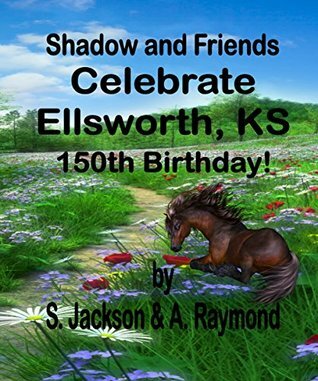 Shadow and Friends Celebrate Ellsworth KS 150th Birthday, written by S. Jackson and A. Raymond, is a tale of animal friends who are preparing for a very special birthday- the 150th celebration of their town. The animals gather round whilst Big Whitey takes a trip down history lane where he tells his friends about the importance of Ellsworth and how the town was first established. Prepare to be thrown into a wild world of cowboys, railroaders, and sheriffs as you learn the fortunes and misfortunes the town has endured to finally reach its 150th birthday. After the history lesson, the animals then begin the celebrations and re-enactments, songs, and poems will entertain them all. 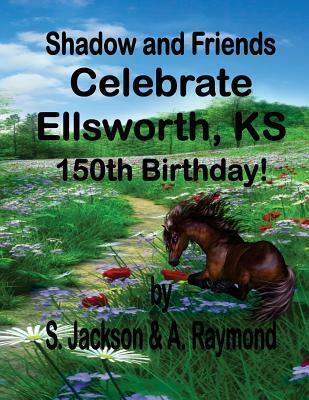 Shadow and Friends Celebrate Ellsworth KS 150th Birthday is a very special children’s book that delves into the history of Fort Ellsworth in an exciting celebration with animals, cowboys, and Indians. Legendary historical characters of Ellsworth come together in lessons on cattle pens, dusty trails and important landmarks. Authors S. Jackson and A.Raymond are able to beautifully paint a picture of the wild west through incorporating animals and history in a playful and engaging story. The storytellers are dogs and squirrels which give the book an animal twist- something which will be sure to spark the imagination of all children. The animals towards the end of the story throw a fabulous re-enactment of history and will encourage children to consider their own town’s history and how they too could get involved with historical celebrations of their town. Travel through time as Big Whitey takes you on a history lesson that begins in the 1800’s and finishes in the present day. The once wild cow town starts with Indians and Cowboys that made homes out of bluffs and built their town through supplying to the military. I loved reading the small excerpts of cowboy slang which gave the story more authenticity and character. I enjoyed how the story had a taste of the old and the new twisted together for a fun-loving plot line. One moment you were in the wild wild west and the next you were taking selfies with animals which are sure to delight both children and adults alike. Even though it is a children’s story, the plot line contains depth and interesting information about life in the old west that will entertain both children and adults. It’s a fun and light-hearted way to explore history and has the perfect mix of education and entertainment. The illustrations throughout the story were bright and colorful and will be sure to grab the attention of all children as they eagerly learn about the town’s history. I particularly enjoyed the animals dressed up in cowboy outfits and old saloon style dresses and how they rode the buggy. The illustrations will only serve to ignite the imagination of the children reading the story and compliment the history lesson perfectly. I would recommend this for children who enjoy stories about cowboys and animals.